As I said, we love giving objects a new purpose. And isn’t it great to go into the story of a piece when someone asks you where you got it? Maybe it’s just me but I love saying, “Oh, I found it at…It used to be used for… The following was an old weathered Russian ammo shipping crate. The client wanted to use it as a seat in their entryway. It needed some wood refinishing. We added legs, child safety hinges and then created a seat cushion for the top. This bathroom needed a petite vanity and sink. The bathroom was restructured by the previous owner and he did not follow design standards. It was impossible to fully open the door with any standard-size vanity or pedestal sink. We found this small piece of furniture at a local store. 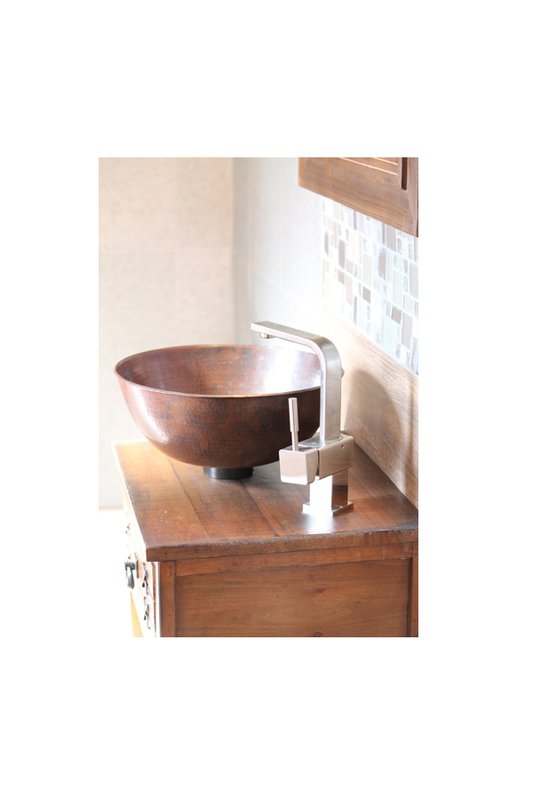 The top gave us just enough space for a hammered copper vessel sink and the faucet. Since it was a new piece of furniture, we didn’t have to do any wood refinishing. But, for extra protection, we used a bar coating on the top and then hand rubbed it to a satin finish. One of the most popular ways of repurposing furniture is to restyle a dresser into a bathroom vanity. Sometimes it can take a while to find a piece that’s the right height, deep enough for a sink and faucet, etc. Using a vessel sink helps with the depth of the piece. There only needs to be enough room for the drain and the faucet. This powder room vanity is a combination of repurposing furniture and refinishing furniture. The wood finish was actually in pretty good shape, but we needed to stain the maple darker to go with the bathroom. Some people convert dressers to bathroom vanities and make the top drawer or two non-functional because of the plumbing. That’s the easy way out. We cut out access to be able to use the rest of the drawer. In this case, the client wanted to have some larger storage space. So, we turned the space from the bottom two drawers into a tall storage area and turned the drawer fronts into doors to keep the original look of the piece. This piece really just involved some simple wood refinishing, then cutting out a space for the sink and plumbing. All of the drawers are functional. The top two drawers are about half their prior size. The middle drawer is only missing a small rectangle out of the center. This client’s coffee table was not the right scale (size) for her furniture arrangement. So, we decided that a custom table was the way to go. This was more than furniture refinishing. We found a few antique pieces made of oak, deconstructed them, stripped them and then created a completely new piece. Then it was just a matter of wood refinishing to complete the project. For this coffee table, the original piece was not technically “furniture refinishing” but the end product was. The scale of this living room and furniture dictated a non-standard, custom coffee table. 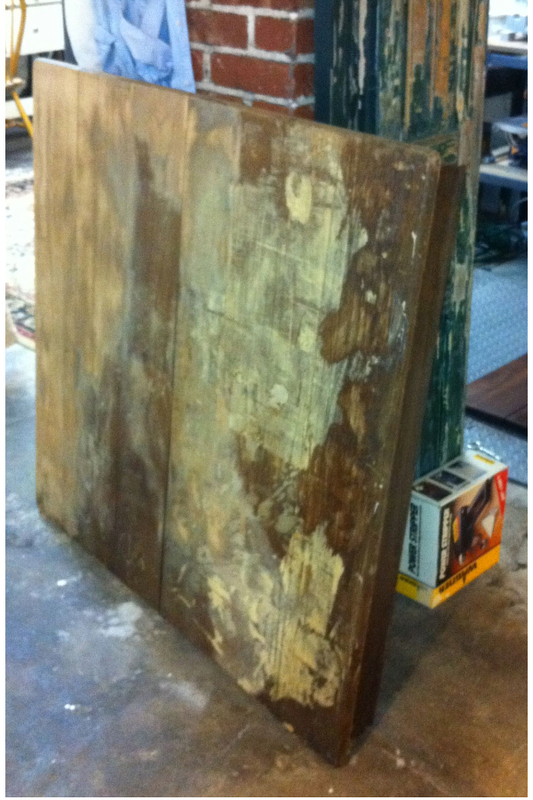 We found a hundred year old door, stripped and finished it then converted it into a coffee table. It’s tough to find a desk that’s just the right size. This one we made out of an old barn door, old bead board and old stairway balusters. So many things can be adapted for new uses. It just takes imagination. 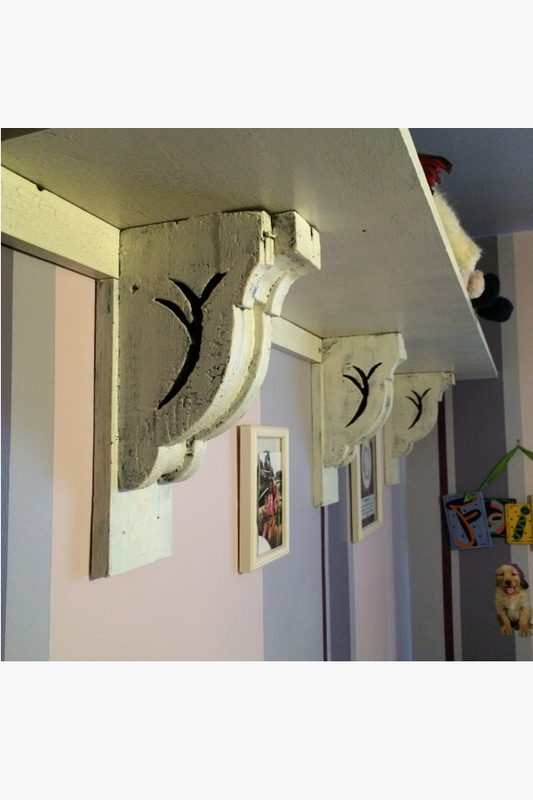 Old corbels can be used as shelf supports, benches as tables and nightstands, toolboxes and crates as wall storage, and anything with a hook can be a key holder. This client “went postal.” This antique mail sorter makes a great looking and unique, family shoe storage area. Structurally sound furniture can be saved by redefining it with paint. Here are some furniture painting examples that got new life. In some cases we also updated them by adding different legs, hardware, etc. 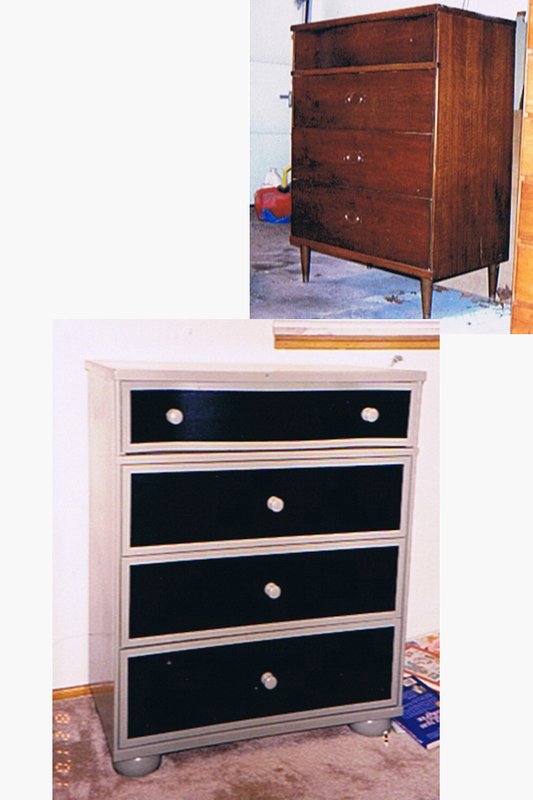 This client wanted to replace her bedroom furniture to brighten the room and give it a new look. But it was good solid furniture. 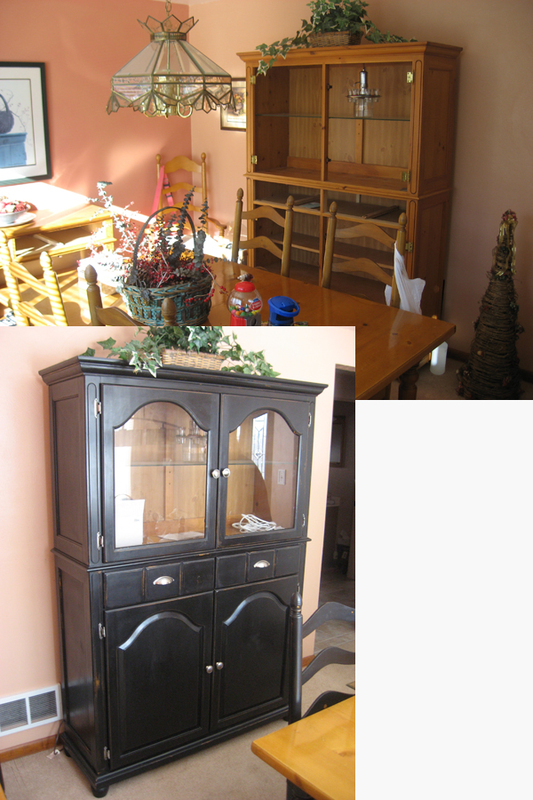 So, we convinced her to let us paint the furniture and give it a distressed look then replace the hardware. Sure looks brighter and different now. In some cases, a client may not even want wood refinishing. This client wanted a completely different look for her dining room set. We downplayed the wood through furniture painting. Kid’s furniture is a lot of fun because of the amount of color we can add. 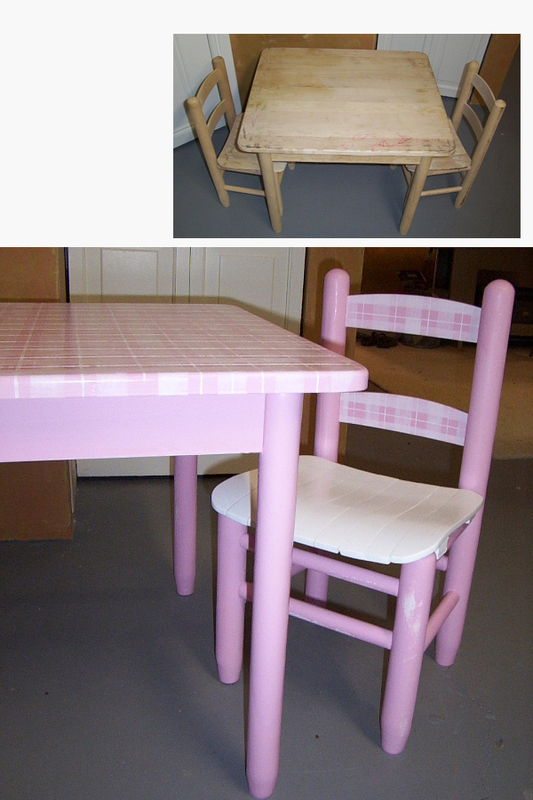 This client’s daughter’s furniture was just crying out for a painted finish. Depending on the size of the kitchen, the cabinets are either the first or second biggest expense in a kitchen remodel. If you aren’t changing the layout of a kitchen, and the cabinets are structurally sound, sometimes it makes more sense to save money by refinishing kitchen cabinets. Just because you’re remodeling your kitchen doesn’t mean you have to replace your cabinets. Depending on the age of your kitchen you could spend twice as much and get lesser quality cabinets to replace them. Is that really what you want to do? This client’s cabinets were original to the home’s construction and we weren’t changing the layout of the kitchen. The cabinets were solid oak and in great condition. The only issue was that the color was dated. We convinced the client to let us finish them instead of replacing them. The cost of replacing these kitchen cabinets would have been high because of the amount of square footage. This home dates back to the 1800’s and the client wanted the kitchen to look appropriate to the period. The melamine cabinets had been finished with a high-gloss white paint. 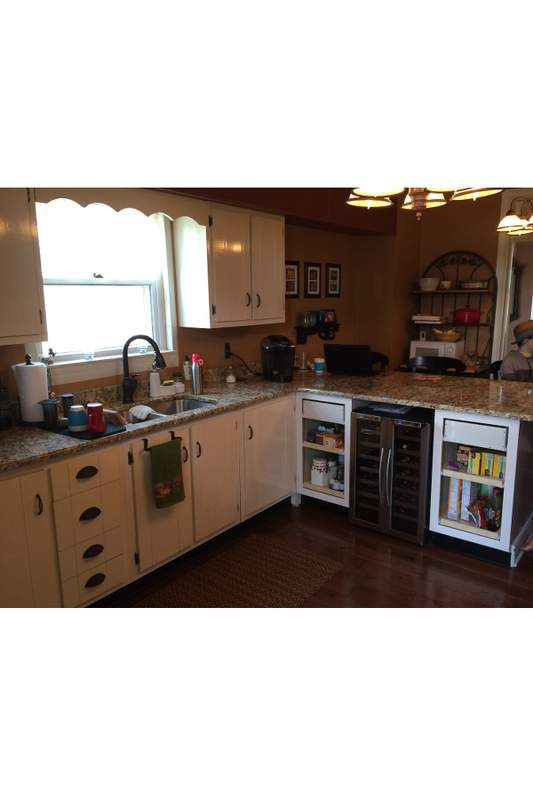 Refinishing kitchen cabinets was the most cost effective way to achieve a period look. They already had the appropriate style. Refinishing cabinets with a period appropriate finish was all they needed. We aged the cabinets with an antique white paint, wet sanding, crackling and glazing. 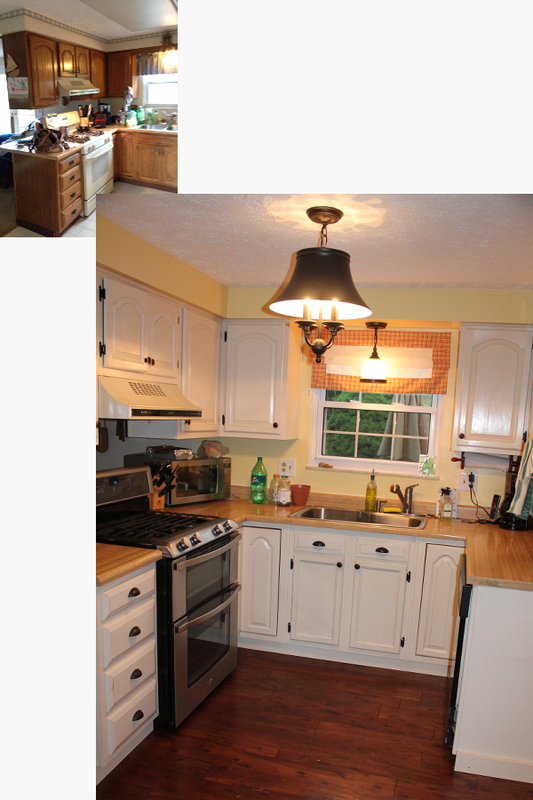 Although not technically “furniture painting”, this kitchen remodel was more than just refinishing kitchen cabinets. The cabinet finishes were in bad shape. Some of the cabinets themselves were in bad shape. It’s difficult to match cabinets when their age and finishes differ. Fortunately this client wanted to brighten the kitchen. So, we replaced some of the cabinets and then refinished them all in antique white paint with a hand-waxed finish. So, you can’t tell the old cabinets from the new. Sometimes refinishing furniture is the best answer. That doesn’t mean it’s inexpensive. It just means that, depending on your current furniture, you could be sacrificing quality by getting rid of your furniture and buying new. If you have good quality furniture, it may be wiser to give a look to what you have. In this kitchen, the client’s table and chairs were solid wood with oak finishes. To replace them would have meant more money and lesser quality. Furniture refinishing was the most cost-effective solution. We accented the original design and construction by keeping some of the original finish in the new furniture refinishing. And we reupholstered the chairs to give them new life. This wasn’t just a simple furniture refinishing done with a coat of stain and polyurethane. Pieces of veneer were missing and the wood grain had to match perfectly to look legit. So, we filled the missing pieces with wood putty then applied multiple layers of glaze to capture the depth of pattern and color. We finished it off by aging the clear coat so that it had the same cracked finish as the rest of the buffet. 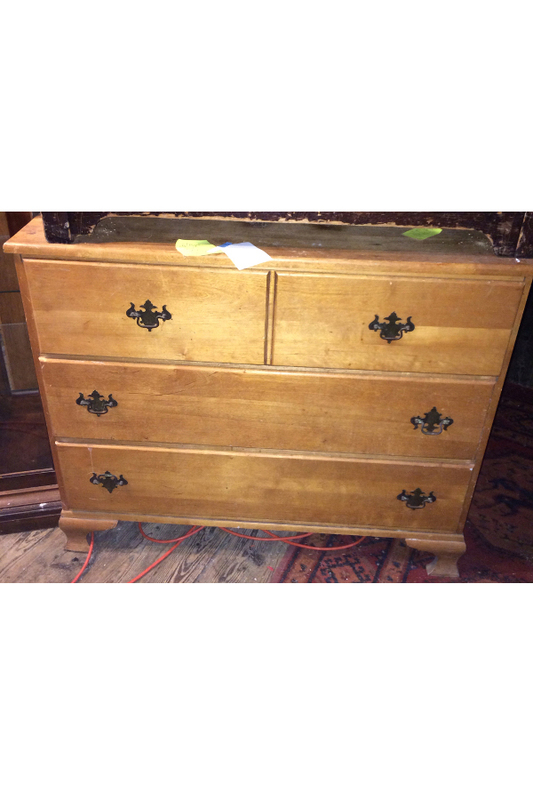 This secretary was a combination of wood refinishing and furniture painting. 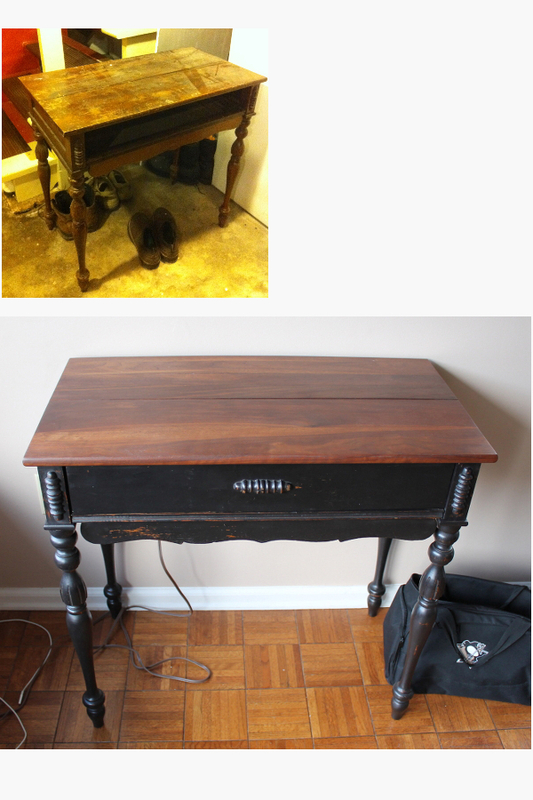 We restored the wood finish on the top pieces but finished the rest of it with antiqued black paint and wax. This plain wood cabinet was extra fine. We just went hog wild distressing it. We covered the door insert with textured wallpaper and then glazed it to give it extra pop. 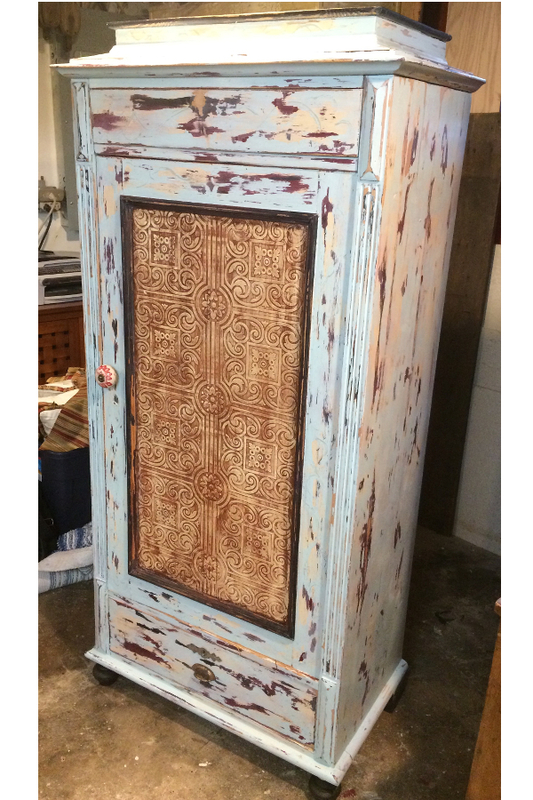 We transformed it into a sewing cabinet for the client. This client wanted to replace the fabric on her chairs. 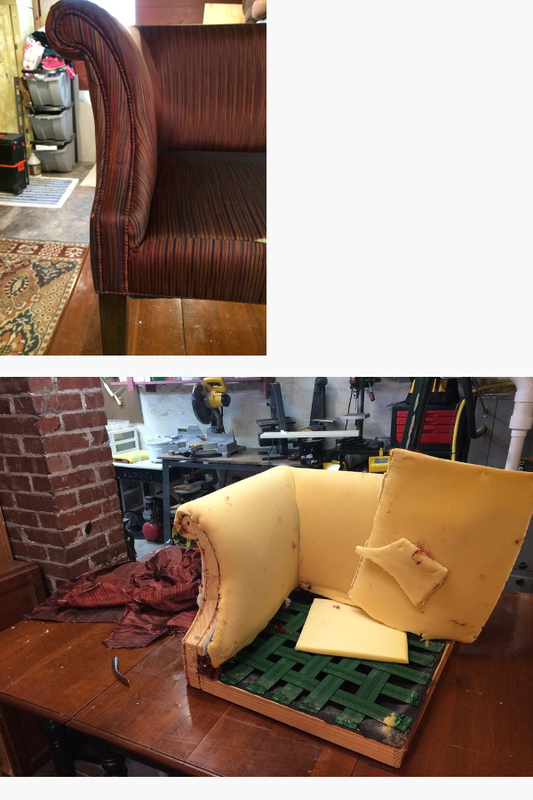 It was a standard reupholster job, but we went beyond and re-stretched the webbing and replaced the worn out padding. It took a lot of time and work to match up all of the lines in the finished product, but you should expect that from a good upholsterer. 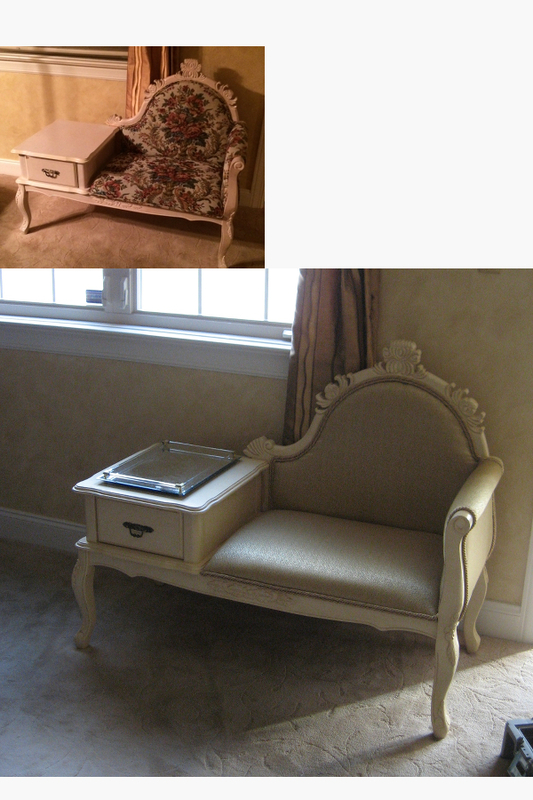 This client wanted to update this chair and a piano bench to match her knew sofa. 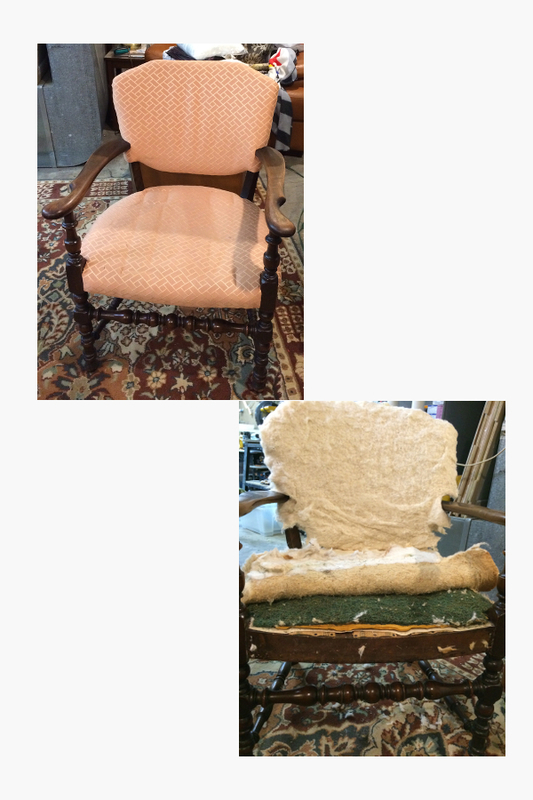 We liked two different fabrics so much that we used them both on the chair — one on the back and one of the front. We added the cording around the front to hint at the fabric on the back of the chair. Then pulled everything together with pillows. The settee in this client’s bedroom also needed to be refinished to match the new bedroom design. It was mostly a reupholster project, but we also refinished the wood to match the other pieces of her bedroom.